In 2011, the United Nations declared October 11th an annual “International Day of the Girl Child.” We are dedicating the mid-year 2016 issue of ANS in anticipation of the October 2016 international observance focusing on girls. We seek manuscripts that address nursing perspectives on health care for girls and women, their families and communities. We welcome research reports that provide evidence for nursing practice, theoretical and philosophic perspectives, or methodologic issues related to investigating health issues and nursing concerns for women and girls. We particularly welcome manuscripts with an international focus. All health care providers encounter situations that call for palliative care, but nurses are at the center of care when palliative care is the approach that is agreed to be the best choice. 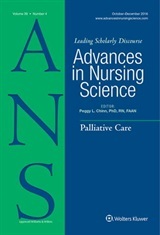 This issue will focus on all aspects of nursing knowledge that influence the decisions and the approaches that shape palliative care. We welcome manuscripts containing research reports that provide evidence for practice, theoretical and philosophic perspectives, or methodologies that are well suited to this area of inquiry. Toxic stress, unlike positive or tolerable stress, can result in life-long health challenges. For this issue of ANS we seek manuscripts that focus on the contributions that nurses are making to understanding the dynamics of toxic stress, and nursing approaches that demonstrate effective outcomes for children and adults suffering the effects of toxic stress. Articles that provide research outcomes, theoretic and philosophic constructions, practice models, or educational programs related to toxic stress are welcome. Implications for the development of nursing knowledge must be emphasized. This issue of ANS marks the beginning of the 40th year since ANS first appeared in print! Throughout the journal’s history, we have featured issue topics that focus on “Critique and Replication” – calling for informative and cutting-edge scholarship that builds on previously published work in ANS. For this issue of ANS we invite the submission of manuscripts that follow our “Critique and Replication” tradition. Manuscripts can take any form of scholarship, such as critical reviews of past ANS publications, data-based research based on prior reports found in ANS, or qualitative explorations that extend ideas addressed in past ANS articles. We especially welcome manuscripts that challenge prior assumptions and that open new perspectives that contribute to the development of nursing knowledge. For this issue of ANS we seek articles that embrace the integral nature of family and community health, particularly in the context of changing family compositions and geographic location patterns. We are interested in exploring, for example, factors such as urbanization, adoption, surrogacy, socio-economic and/or racial segregation, and ideologic polarization. Articles must reflect scholarly merit and a clear focus on nursing knowledge development. We welcome all forms of scholarship, including qualitative or quantitative research, philosophic or theoretic constructions, critical integrative reviews, and models developed to guide practice. Manuscripts submitted as “ANS General Topic” are expected to address the purposes of ANS, which are to contribute to the development of nursing science and to promote the application of emerging theories and research findings to practice. We expect high scholarly merit, and encourage manuscripts that challenge prior assumptions and that open new perspectives that contribute to the development of nursing knowledge.